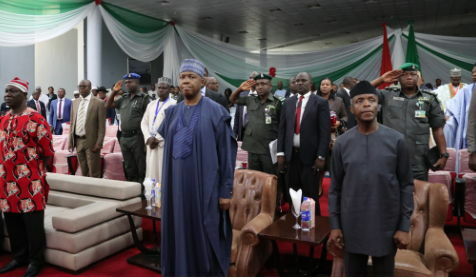 He spoke at the opening ceremony for the two-day summit on national security organised by the Senate on the spate of killings by herdsmen and other crimes across the country. The Senate majority leader, who spoke to State House correspondents in Abuja on Friday, described Osinbajo’s stance on State Police as “very good suggestion’’. “Well, I’m not a legislature because I am only one member of the legislature. “But as a committee member of the ad hoc committee on security and the review of security infrastructure in Nigeria, I believe that the suggestion by the Vice President that we should go the way of state Police and even consider community policing, is a very good suggestion and we are going to take it on board in the National Assembly,’’ he said. On the appointment of Asiwaju Bola Tinubu as “Chief Mediator’’ of the internal crisis within the All Progressives Congress (APC) by President Buhari, Lawan said the reconciliation committee was `fantastic’. According to him, the committee should have been constituted long time ago to reconcile all aggrieved members of the party. “Fantastic! In fact that committee should have been constituted long time ago because APC is plagued by some internal issues and I believe that these are issues that are surmountable. “The Tinubu committee will definitely add value into reconciling the warring sides so to speak. “Time is against us, we have to really kick-start these processes of reconciliation immediately and I believe that as a family we should be able to come out very much united than we were before.’’ The Senate leader observed that the ongoing security summit organized by the National Assembly was a typical example of collaboration, cooperation and partnership between the executive and the legislature.